Fox’s Garden by Princesse Camcam (2014). This is a powerful little book. A wordless book. A book made of cut paper that comes to life. A book that will stay with you as it did with me. So before I say anything else about it, here are images from inside, in order to give you a taste of the experience of reading it. Did you feel it? Sadness when the fox looking for shelter is kicked out by the man. Wonder and hope when the boy sees the fox enter the greenhouse. And then, surprise when the boy discovers the fox with her cubs! There’s one more surprise in this book, but I won’t give it away here. Let’s just say it’s called Fox’s Garden for a reason, but not necessarily the one you might dream up. It’s the reason Princesse Camcam dreamed up. And I’m so glad she did. It’s a surprise that promises joy and hope. I’ve left for last this one’s other magic—its illustrations, each a cut-paper art box photographed for the spreads of the book. They’re intricate still-lifes that make us feel this whole world is real. Because of course it is. This film is also French. And it’s about a child and a fox, like the book. It’s beautiful; the landscapes are breathtaking in every scene. But it’s a heartbreaker. And I’d also say, given some of the horrible things the fox endures and the sheer terror of watching and rooting for her, it may not be for young children. Let’s just say, I wept big, fat, sad tears watching this movie. A 1o year old girl finds a fox in the forest. Patiently, over seasons, she convinces the fox she’s safe (unlike many other humans). They visit. They bond. The girl names the fox. The girl tames the fox. And it is a beautiful thing to behold. But one fraught with troubles ahead. Because a girl and a fox are not meant to live together, however much they might like the idea. However much they might be friends. It’s a film to show us foxes in the forest and how they live. And it’s a film to teach us more than that. About kindness. About how sometimes kindness is in keeping an eye out but withdrawing one’s hand. You could cozy up and read one, then watch the other. Talk about foxes and nature and how to be kind to the world. read the book, watch the film, be kind! WHOA. Both of these have left me speechless! Girlfriend, you find some serious treasures! Oh, how wonderful! All of it. The loveliness of it all makes me ache! I always love your thought provoking posts. This theme touches my heart. I’ve added Fox’s Garden to my wish list. Oh, the sadness in the boy looking out the window, the droop of the fox’s tail. Just wow! I didn’t know about this publisher. Such works of art! Thank you for highlighting these! 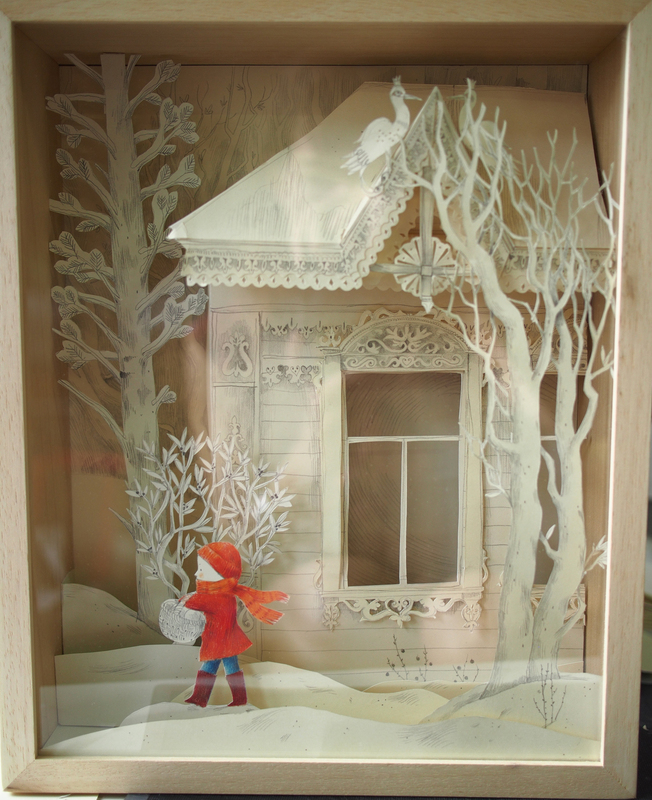 Wow the cut-paper art boxes are incredible! The images for this book are so incredibly beautiful!! !